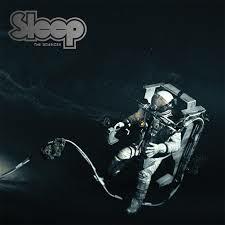 Review: "Sleep: The Sciences" - Sea of Tranquility - The Web Destination for Progressive Music! Man, has it really been almost 20 years since 1999's apocalyptic doom/stoner masterpiece Dopesmoker, the last studio effort from California kingpins Sleep? That indeed is the case, so it's with great anticipation that the band have risen from the depths to unleash this latest monster, simply titled The Sciences. Here in 2018, Sleep are comprised of Al Cisneros (bass guitar, vocals), Matt Pike (guitar), and Jason Roeder (drums), basically the same trio that have been holding down the fort since 2010. with six tracks, three of which top the 10-minute mark, that band have once again put together a platter of mammoth proportions, the riffs enormous and HEAVY, cannabis permeating every arrangement, and the grooves pummeling. After the brief instrumental title track opens up the album with a cascade of feedback and guitar torture, the band lurch in with the delicious stoner vibes of "Marijuanaut’s Theme", the riffs slow, heavy, and pulverizing, Cisneros' lead vocals not unlike Ozzy's from the classic Master of Reality album. The epic "Sonic Titan" follows, and again it's a visit to legendary Black Sabbath territory, the mountains of fuzz cascading over the listener in glorious fashion, the drums crashing the bass boiling...this is the way doom/stoner music should be created folks. Prepare to crank this one up and shake the foundations! "Giza Butler" is of course a reference to Sabbath's legendary bassist Geezer Butler, and it's a titanic fest of psychedelic doom as only Sleep could pull off. At nearly 15-minutes long, "Antarcticans Thawed" is the longest epic here, the sonic quality just as massive as the length & song title predicts, the riffs all-consuming, the little bits of psychedelia dripping through the cracks, and the wah-wah lead guitars stabbing through the smokey haze. Closing bruiser "The Botanist" is piledriver atmospheric doom, featuring some of The Sciences most scorching lead guitar work from Pike, dripping with wah-wah and fuzz, no need for vocals to convey its potent message. In short, The Sciences is a remarkable release from a band that haven't sniffed the studio for a full length album in a long time. This is HEAVY stuff here folks, the perfect marriage of stoner, psych, and doom from a band who are once again primed to lay waste to everything in their path.